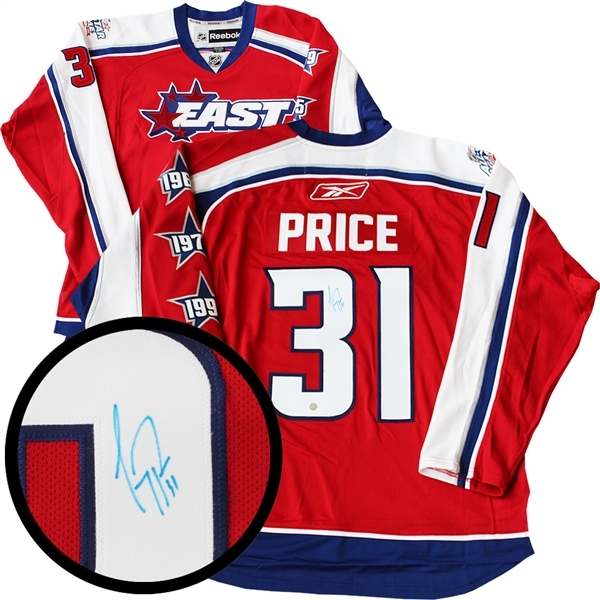 This 2009 NHL All-Star Replica Jersey has been personally autographed by Montreal Canadiens goalie Carey Price. This jersey features a red, white and blue colour scheme with the "EAST" logo on the front, representing the Eastern Conference. On the left side of the arm it features the three previous years the Montreal Canadiens hosted the All-Star Games. On the top of the right shoulder it features the patch from the 2009 NHL All-Star weekend in Montreal. Drafted fifth overall in the 2005 NHL Draft, Carey Price did not start his All-Star career until the 2007-2008 NHL season. In his rookie season Price played in a total of 41 games, collecting 24 wins ending the season with a .920% save percentage average. Price would continue to grow his prominence in the league in the following year as he was selected to play in his first ever NHL All-Star Game in 2009 representing the Canadiens on home soil in Montreal at the Bell Centre. As his career progressed, Price would continue to put up All-Star numbers leading him to win four NHL awards during the 2014-2015 season. These awards included the Vezina Trophy, Hart Memorial Trophy, William M. Jennings Trophy, and Ted Lindsay Award. To date, Price currently sits on the Top 3 Montreal Canadiens All-Time wins list for a goalie and is the Top Goalie in the Canadiens franchise with most games played. Frameworth is the exclusive autograph provider of Carey Price. It comes complete with a Frameworth hologram and COA to ensure the authenticity of the signature. We do not guarantee any specific jersey sizes but we typically carry sizes L, XL or 52, 54 & 56 for jerseys. These sizes are considered the most ideal for framing & displaying.